Congratulations to graduate student Stephen Smith who was awarded the 2019 John Hostetter Award for his impressive scholarship accomplishments! Good job!! Undergraduate researcher Jamie Takashima is a recipient of a prestigious 2019 UA Beckman scholarship. Congratulations Jamie, keep up the good work! In addition, our manuscript on the effect of caffeine in Dictyostelium has been accepted for publication in Molecular and Cellular Biochemistry. This was truly a collaborative work, congratulations and thanks to all contributing authors! Finally, we have been awarded a 5-year R01 grant from NIH-NIGMS of ~1.5M to study the role and regulation of the mechanistic Target of Rapamycin Complex 2 (mTORC2) in directed cell migration. Congrats!!! Welcome to two new undergraduate student researchers: Jordan Pilch and Jamie Takashima. Jordan is working with graduate student Agata Orlinski on investigating the nature and role of the Rap1:SIN1 interaction in controlling mTORC2 function in cell migration; and Jamie works with staff scientist Tariq Islam on investigating mechanisms controlling chemoattractant GPCR signal transduction. Welcome to you both! Congratulations to graduate student Stephen Smith, recipient of a 2018-19 BCP fellowship! Also congratulations to graduate student Shannon Collins, recipient of a 2018-2019 Dr Maria Teresa Velez Diversity Leadership Scholarship! Undergraduate Ramya Ramesh and PhD student Maggie Scavello both graduated this semester, congratulations! In addition, Maggie defended her dissertation on May 14, and Ramya won best senior thesis in Biochemistry! You both rock! We had a fun bowling graduation/farewell party that we will all remember! We will miss you both! Tariq Islam's manuscript, on the analysis of heterotrimeric G protein activation in response to chemoattractant stimulation in Dictyostelium using Bioluminescence Resonance Energy Transfer, has been published in Cellular Signaling! Congrats! Congratulations to Maggie Scavello and Ramya Ramesh, both recipient of a Galileo Circle scholarship! Congratulations to Shannon Collins, the 2018 recipient of the Herbert E. Carter Award in Biological Chemistry! You deserve it Shannon, congrats! Welcome to two new graduate students Alyssa Werner and Genesis Cahigas! Alyssa is working on the role and regulation of mTORC2 in breast cancer cell migration and Genesis is working on elucidating the role of small GTPase Rap1 in the regulation of mTORC2 and cell migration. Welcome to new undergraduate student researcher Isabella Brown. Isabella is working with Shannon Collins on investigating the role of Ras in regulating mTORC2 function in breast cancer cell migration. Welcome to new undergraduate student researcher Ethan Weiss. Ethan did a summer high school internship with us and now has started at the UA in Biochemistry! We're really happy you are joining the team, Ethan! Ethan is working with Stephen Smith on investigating how Ras interacts and activates mTORC2. 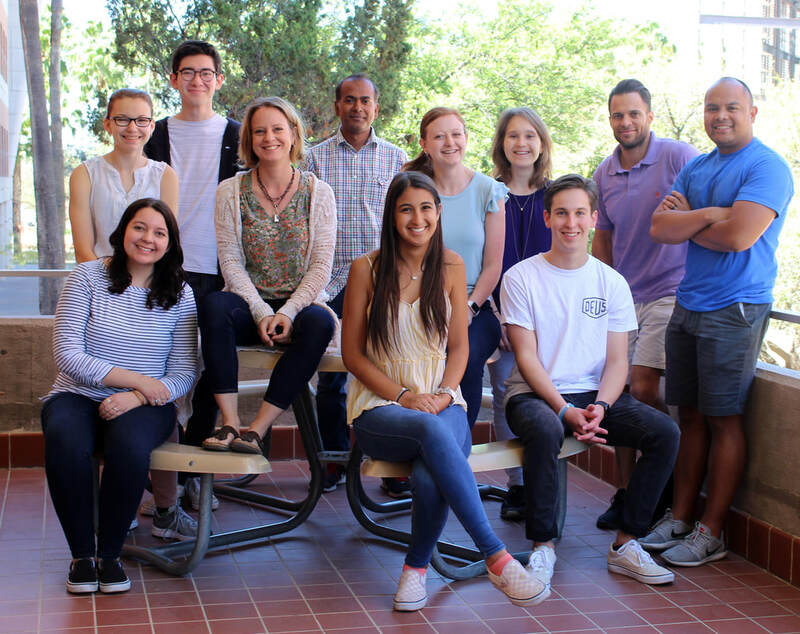 Charest lab March 2019. Absent: Stephen Smith and McKenna Schultz.